Installation 04: Steaming hot apple, anybody? 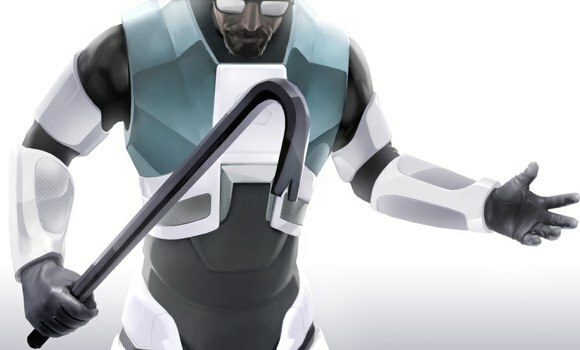 Does Gordon Freeman look a bit different to you? He's wearing a suit that's sleek, shiny, and white. And what's that on his chest? Almost obscured by the crowbar but just visible enough to make out is an... apple? Yes folks, this is a monuments day indeed. Valve has announced support for both Steam and the Source engine on Mac. Included is a new feature called Steam Play in which you may purchase either the Mac or PC version of a game and be able to play the other version for free. Essentially, you get a free copy of the game. Valve's Jason Holtman elaborates, "For example, Steam Play, in combination with the Steam Cloud, allows a gamer playing on their work PC to go home and pick up playing the same game at the same point on their home Mac. We expect most developers and publishers to take advantage of Steam Play." And if Valve expects most developers to take advantage of Steam Play, that means they also expect most developers to, well, develop a Mac version of their game. This April, Valve is bringing their catalogue of games to the Mac including L4D2, Team Fortress 2, Counter Strike, Portal, and the Half-Life series. It has also been announced that Portal 2 will be the first new multiplatform game of Valve's that will release simultaneously on the Mac and PC. From there on out, it'll be the norm. With Valve and it's Steam platform leading the way, it would be surprising if other developers didn't follow suit. This is only the beginning, people. It looks like Mac gaming might be making a comeback in a big way. More details here. In other news, Valve still refuses to acknowledge the existence of the PS3. But the real question is weather or not the game will be on consoles aswell? Uh, yeah. Valve develops games for the PC, Xbox, and (now) Mac. No PS3 love, though. And Kromebear, the way you type Mac, you make it sound like an acronym and not a abbreviation. You're writing MAC, as in Magnetic Accelerator Cannon or Media Access Control.